We are pleased to bring you these recommendations for proper storage, handling, and cooking procedures. We are always pleased to provide any advice we can to our clients to improve the quality and safety of their meals. Season beef as desired. Place on cooking grid directly over coals. Heat oven to temperature as specified in chart below. Place roast, fat side up, on rack in shallow roasting pan. Season roast, as desired. Insert ovenproof meat thermometer so tip is centered in thickest part, not resting in fat or touching bone. Do not add water. Do not cover. Prime Rib 350 deg F. 4 to 6 lbs Medium rare: 1 and 3/4 hrs to 2 hrs 135 F.
Medium: 2 to 2 and 1/2 hrs 150 F.
6 to 8 lbs Medium rare: 2 to 2 and 1/4 hrs 135 F.
Medium: 2 and 1/2 to 2 and 3/4 hrs 150 F.
8 to 10 lbs Medium rare: 2 and 1/2 to 3 hrs 135 F.
Medium: 3 to 3 and 1/2 hrs 150 F.
Sirloin Tip 325 deg F. 4 to 6 lbs Medium rare: 2 to 2 and 1/2 hrs 140 F.
Medium: 2 and 1/2 to 3 hrs 155 F.
Medium rare doneness = 145°F final meat temperature after 15 minutes standing time. If you plan to keep fresh cuts of meat more than 48 hours after purchase, store it immediately in the freezer and thaw before use. After meat has been cooked, cool leftovers in the refrigerator uncovered. Then cover and wrap them within one hour of cooking. Store cooked leftovers in the coldest part of the refrigerator for up to four days, or freeze immediately after wrapping. Identify with dates all such items in your freezer. One of the best ways to minimize the risk is to "keep it cold." Refrigerators should be kept between 32°F - 40°F. The times listed below are good rules to stick by when storing meat; though, when in doubt - throw it out! Please also read and follow our sections on Meat Storage and Defrosting recommendations. Always defrost and marinade meats at refrigerator temperatures!! Use a thermometer frequently to verify the temperature of your refrigerator and freezer. 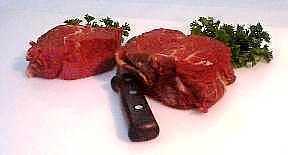 All meat should be defrosted in the refrigerator, or during the cooking cycle. Defrost during cooking by increasing the cooking times by 1/3 to 1/2. Broil frozen pork chops on the lowest oven rack. Because today's pork is so lean, it's important not to overcook it. Yet, for many, one of the first food safety rules learned was never to serve pork unless it's been cooked to well-done in order to avoid trichinosis. But cooking to 180° leaves pork tough and dry. The good news is, this advice is outdated. 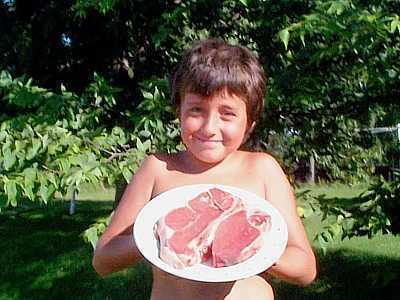 Modern methods of farming have made trichinosis virtually nonexistent. Plus, the USDA has established that cooking pork to an internal temperature of 137°F kills Trichinella spiralis. The USDA currently advises the final temperature for cooked pork should be 160°F. Remember to "think pink". For fork-tender, juicy pork, cook to medium-done which is an internal temperature of 160°F. Pork cooked to 170°F will lose almost all of its pink color and juiciness. Information on this page is provided by and with permission from the National Pork Producers Council at www.nppc.org, and the National Cattlemen's Beef Association. 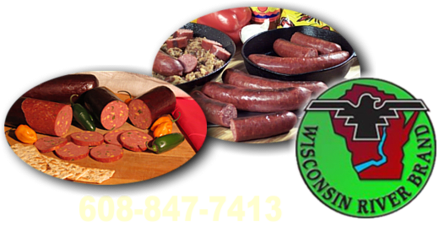 Service Area: Mauston, Wisconsin Rapids, Tomah, Portage, Waunakee, Wisconsin Dells, Viroqua, Lodi, Montello, Pardeeville, Cross Plains and surrounding communities. Page Summary: Wisconsin River Meats offers food safety, cooking pork, cooking meat as well as food safety and hygiene, cooking meat times, food safety cooking, food safety tips, defrosting meat, food safety practices, guidelines for food safety for Mauston, Baraboo, Sparta, Tomah, Reedsburg, Black River Falls, Prairie Du Sac, Sauk City, Lake Delton, Wisconsin Dells and surrounding Wisconsin communities.